Your choice of toppings: Shredded iceberg lettuce or cabbage, , thinly sliced radish or jicama, diced avocado, minced white onion, sour cream or crema, shredded monterey jack cheese or queso fresco, minced cilantro, crispy tortilla strips or crumbled tortilla chips, lime wedges, and Tapatio. Pour the chicken broth and water into a large enameled dutch oven. Add the chicken breasts and simmer for about 25 minutes, or until the chicken has reached an internal temperature of 165 degrees Fahrenheit. Use tongs to remove the chicken breasts from the cooking liquid and place on a plate to cool. Keep the cooking liquid for later. 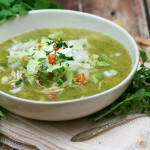 While the chicken cools, add the tomatillos, onion, garlic, poblanos, serrano, cilantro, and oregano to the blender. Scoop 1 cup of the chicken cooking liquid into the blender as well. Pulse until combined, then blend until smooth. Add 2 tablespoons of olive oil to a large nonstick skillet and warm over medium heat. Add the tomatillo puree and cook, stirring occasionally, for 10 or 15 minutes, until the sauce has turned dark green. As the sauce cooks, shred the chicken breasts and discard the skin and bones. Add the shredded chicken and the hominy to the pot with the chicken broth. When the tomatillo sauce is done simmering, pour it into the pot as well. Bring to a simmer, then ladle into bowls and top with all the toppings your heart desires!